It is tough to admit when you've made a mistake. Particularly a factual error. Particularly when I've only been posting about a week on this blog, and already, only four posts in, I find I have to eat my words. But I am committed to the truth and to maintaining intellectual integrity on this site, so - time to face the music. "Certainly nothing has transpired in the single party, undivided, non-gridlock, no veto, no filibuster government of the last six years that would counter the conclusions in these articles. In that time we have seen nothing but increasing federal spending, creation of new bureaucracies, breathtaking record deficits, and government growth that rivals LBJ's "Great Society". The problem in that statement is the word "rivals". I made the assumption that the years of single party control during LBJ's Great Society / Vietnam War spending binge was the penultimate, the "Everest", the "Gold Standard", the "Platonic Ideal" of Bloated Big Government spending. A high water mark that could only be "approached" or "rivaled" but never be exceeded. Then I found this paper from those hard number, rigorous analysis guys at the CATO Institute (excerpted and linked below). Based on this work the word "rivals" in the above sentence should be replaced with the more accurate "blows away". My apologies to the readers of this blog. We now have a new gold standard for Bloated Big Government Spending. "Bush Beats LBJ on Spending"
"In Cato Tax and Budget Bulletin no. 26, Stephen Slivinski uses revised data released during the summer by the Congressional Budget Office (CBO) to make side-by-side comparisons of the spending habits of each president during the last 40 years. 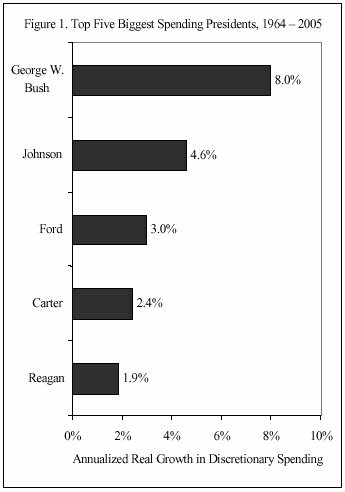 While the data show that all presidents presided over net increases in spending, George W. Bush is shown to be one of the biggest spenders of them all, even outpacing Lyndon B. Johnson in terms of discretionary spending [...]"
"The increase in discretionary spending - that is, all nonentitlement programs - in Bush's first term was 48.5 percent in nominal terms. That's more than twice as large as the increase in discretionary spending during Clinton's entire two terms (21.6 percent), and just higher than Lyndon Johnson's entire discretionary spending spree (48.3 percent)." "Bush has expanded federal nonentitlement programs in his first term almost twice as fast each year as Lyndon Johnson did during his entire presidency." "George W. Bush's tenure has so far been a return to the Johnson and Carter philosophy of budgeting that gives increases to all categories of spending." "Members of President Bush's staff argue that much of the growth in discretionary spending is essential to defending the United States against the threat of terrorism here and abroad. However, increased spending on fighting terrorism and for the operations in Iraq and Afghanistan does not explain the increases in the overall defense budget." "George W. Bush is the biggest spending president of the past 40 years in both the defense and domestic discretionary spending categories by a long shot. " "The expenses related to cleanup and rebuilding of the Gulf Coast region as a result of Hurricane Katrina's destruction have not been fully tallied... If these budget increases are not offset by cuts in other areas of the budget, Bush's spending record will look even worse next year." UPDATE: SUNDAY (07-May-06): On Friday (05-May-06), Larry Kudlow broadcast an interview with the President on his daily CNBC show, interspersed with commentary by Robert Reich (former Labor Secretary under Clinton) and Steve Moore of the Wall Street Journal. I am going to have to paraphrase this from memory, because I cannot find a transcript (If I find one I'll update this update). Kudlow asked the President about increasing conservative concerns regarding the out-of-control spending in this administration - saying it was the worst record since LBJ (of course we now know it is even worse than LBJ). Bush responded to Larry with condescending broad generalizations and quoting statistics on discretionary spending that simply did not match the facts. Kudlow looked like a deer in the headlights and could not get to his next question fast enough. A few minutes later Kudlow, Reich, and Moore did an "analysis" of the segment. Reich had his usual "I can't believe I even have to explain this to you" demeanor and was predictable in his anti-Bush response. It was Moore that surprised me and sent me scrambling for the transcript as I could not believe what I was hearing. Understand, Steve Moore's official title at the Wall Street Journal is "Editorial Apologist in Chief for the Bush Administration". His most recent book is "Bullish on Bush: How the Ownership Society Is Making America Richer." Paraphrasing Moore, he said: Larry I have looked that numbers up down and sideways. I don't know where the President is getting those numbers. The President is wrong. The spending in this administration has shown no restraint. So this leaves us with a distasteful choice. In that interview President Bush was either knowingly misrepresenting the facts regarding spending in this administration, or he was completely ignorant of the facts regarding spending in this administration. I cannot tell you which alternative is worse. Thanks for the comment regarding my GWB ain't no LBJ article. I have a few comments on yours. There are a few other differences between GWB and LBJ. On the other hand, poverty has risen during GWB's fiscal profligacy, with tax cuts and spending increases as government revenue declines. And poverty is rising because the benefits of GWB's fiscal policy is welfare for corporations and the super-rich, while everyone else loses ground economically due to inflated medical costs, gasoline and food prices. Despite your disdain for government spending, at least LBJ's spending had a social good as it's end, where GWB's results are increasing inequity. We can certainly debate the efficacy of LBJ's "Great Society" spending. Howver, I'll grant you that it was clearly spent with very good intentions. I hope you will agree that it also produced significant negative unintended consequences, some of which we are still wrestling with today. 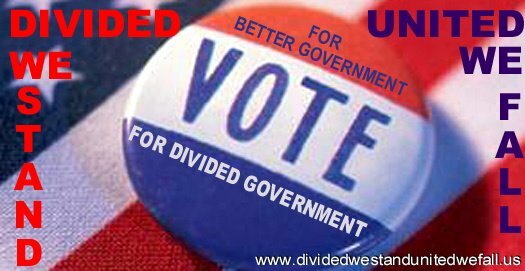 The voters that put LBJ in office got exactly what they voted for, while the voters who put GWB in office and expected a fiscally responsible conservative, did not get what they voted for.